G / S to take part in AIA Homes Tour! The Van Adelsberg / Grant Residence will be featured on the Portland Architectural and Design Festival’s Home Tour taking place October 1st. The original, mid-70s contemporary, 1 bedroom house was designed by Edgar Waehrer. In keeping with the original spirit of the “house in the trees,” the new design adds 2 bedrooms, a home office and expands the interior spaces while retaining its original contemporary northwest form. This homes tour provides a rare opportunity for guests to glimpse inside six sensational Portland residences. Featuring both cutting-edge and historic homes designed by architects, this daylong self-guided tour is a not-to-be-missed event! 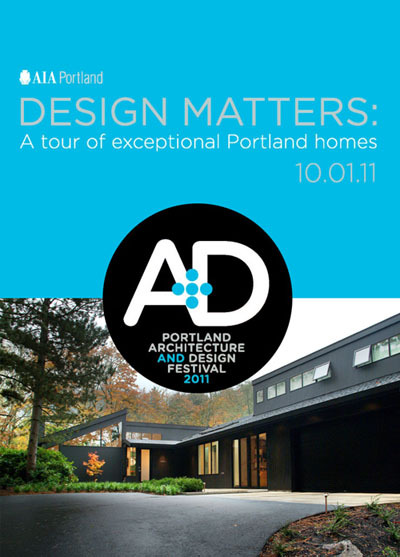 The Design Matters homes tour is open to all, from design enthusiasts to professionals, builders to homemakers, students to senior citizens, and is a highlight of the 2011 Architecture + Design Festival, presented by the American Institute of Architects Portland. For more information, please call AIA Portland at 503-223-8757. Just $40! Includes access to six featured homes, printed program with maps, and interactive iPhone app with GPS. Tickets and additional information for the home tour can be found at: www.aiaportland.org.